In the summer I often make large batches of Bourbon-Peach lemonades for BBQ parties and almost always for the 4th of July. This fun drink was easily adapted and embellished into a slightly more refined punch service for that elegant outdoor summer BBQ picnic or soirée. Of course it will also work at any event you wish, even packing it into a cooler for a beach or pool party, so have at it! To commemorate liberté, égalité, fraternité between France and the fledgling United States and in celebration of the Independence from the tyranny of British rule with the aid of our French friends and allies, I thought American Bourbon Whiskey along with Fine French Cognac Brandy would be a fine and natural alliance and the sturdy backbone to this wonderful summer punch. This made me then remember the classic 1949 film, The Fighting Kentuckian, starring John Wayne as John Breen, the the leader of a band of Kentucky Militia making their way home after the Battle of New Orleans, circa 1816. The militia and John Breen get sidetracked in the assistance and defense of a group of French exiles and settlers in Alabama and by the beautiful Fleurette de Marchand. In the end, the bad guys are defeated, John Breen gets his fair maiden and Fleurette gets her Fighting Kentuckian and I imagine this would be the punch served at their nuptials and party. The blend of rough and tumble Kentucky back woodsman and cultured European aristocracy in alliance on the battle field and in love…and, of course, in the spirits of Kentucky and France. And that brings us to The Natchez Trace. It was a 440 mile ancient and historical trail leading from Natchez, MS to Nashville, TN and linking the Tennessee Valley with the Mississippi River in the south and was the gateway to the deep south, the gulf, and trade and exploration. I imagine Natchez Trace as a good part of the way back home for the Fighting Kentuckians, but it was the real highway for the many traders, Native Americans, and explorers of the day between the late 18th and early 19th centuries. 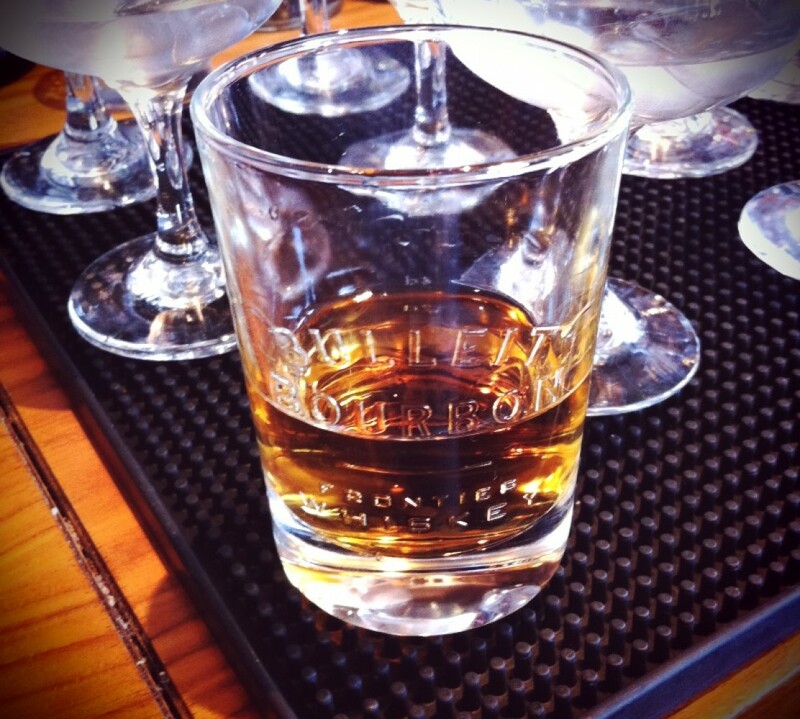 Whiskey and Cognac go together like John Breen and Fleurette de Marchand. The substitution of lemon cordial in place of the stalwart of punches, the oleo sacharrum, adds part of the sweetness you will need for this punch, along with the wonderful lemon aromas you want that plain lemon juice is always missing. The cordial also adds the acidity and depth of lemon juice, much like a lemon sour, along with the aromatic benefits of the oleo. This then does the work of several ingredients in a natural and concentrated form. The recipe for lemon cordial is in a previous article. It is a little bit of a process, but the ingredients are simple and it is well worth the effort since you can make a large amount and store it in the refrigerator with no degradation in taste or aroma and with a veritable unlimited shelf life. The addition of a fruity summer wine adds length and body to the punch, filling in the cracks without the use of plain water. The addition of unsweetened hibiscus tea adds a floral note and the extra needed acidity to balance the liqueurs. The addition of peach liqueur adds sweetness along with a spirited peach flavor. The addition of orange liqueur adds some more sweetness and plays a citrus supporting role for the lemon. The addition of ripe peaches is all American and a staple of southern drinks and desserts. The natural stone fruit aromas, juice, flavor and appearance go with everything in this punch. There are peaches that will be macerated in Bourbon and Cognac and strained out and fresh sliced peaches added to the punch bowl. For the Punch Service I like a large glass bowl, but I do not like the little cups. So I get oddball antique/second hand glassware from resale shops. They should be very inexpensive. 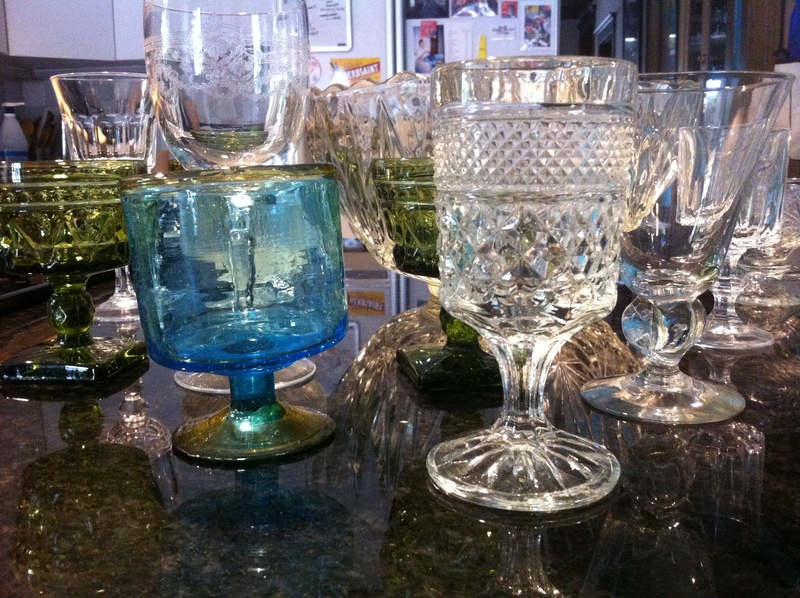 Goblets, dessert glasses, ornate wine glasses, etc..All different sizes and shapes and colors. The look blows the little cups out of the water and is a ton more fun. Decant the Bourbon and Cognac into a large glass jar or Cambro container, large enough to hold the spirits and peaches. Something similar will do as long as it can be sealed and is non-reactive. Small dice 6 fresh peaches and add to the container of spirits. Add the orange and peach liqueurs to the container. Allow to rest for 2 to 4 hours or overnight is even better the night before. Agitate the container from time to time. After the peaches are done macerating in the spirits, strain the spirits off and place spirits in container in the refrigerator or on ice in a cooler until chilled and needed. Save the macerated peaches to add to punch goblets or snack on later. Do not throw them away! 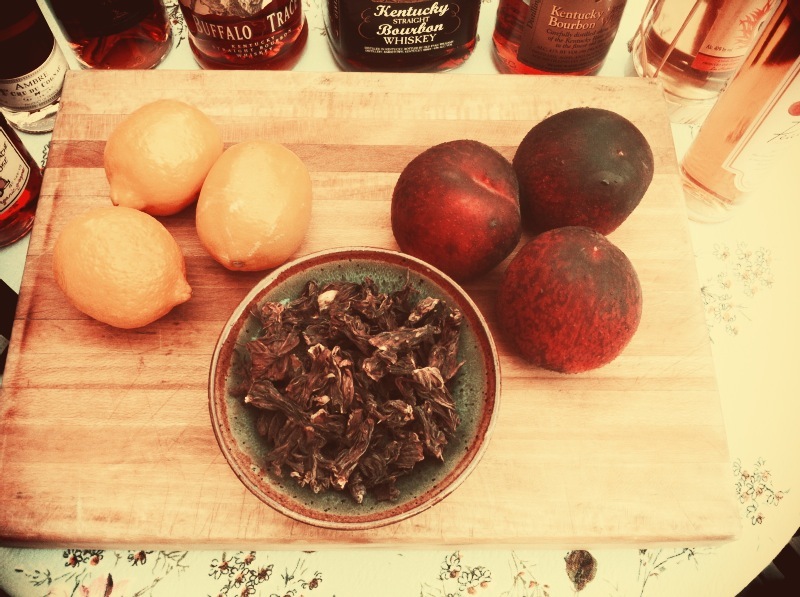 While the peaches are macerating, make the hibiscus tea. 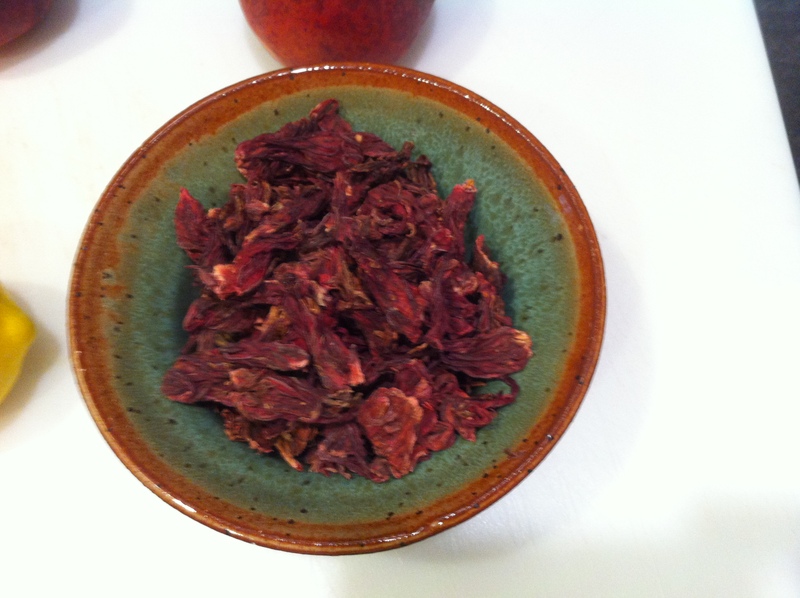 Add 1.5 oz of dried hibiscus flowers and 4 orange pekoe tea bags to 20 oz of hot water and steep for 10-15 minutes. Strain this and allow to cool and chill in refrigerator until needed. This will be more than needed for the punch but extra is good to have if you want to add more or use in a lemonade. Lemon cordial should already be made, but if you haven’t had a chance to make it, the following is a quick sour version that will work perfectly. Wash and zest/peel the lemons and set the lemons aside. Fine chop the lemon peel and set aside. Slice and juice the lemons. In a non-reactive bowl, add juice and sugar and mix until the sugar has dissolved. This take a bit of stirring, but it will dissolve. Add the lemon peel to the lemon sour mix and cover. Glass mason jars work great for this. Chill in refrigerator until needed. Strain the lemon peel when needed. This can be made the night before. This will make approximately 12 oz of sour mix. To make more just use the 1-1 ratio for the sour and increase. This is the perfect base for making fresh lemonade for your party as well, so make more than you need for the punch and make some lemonade for those who don’t imbibe or are just thirsty. 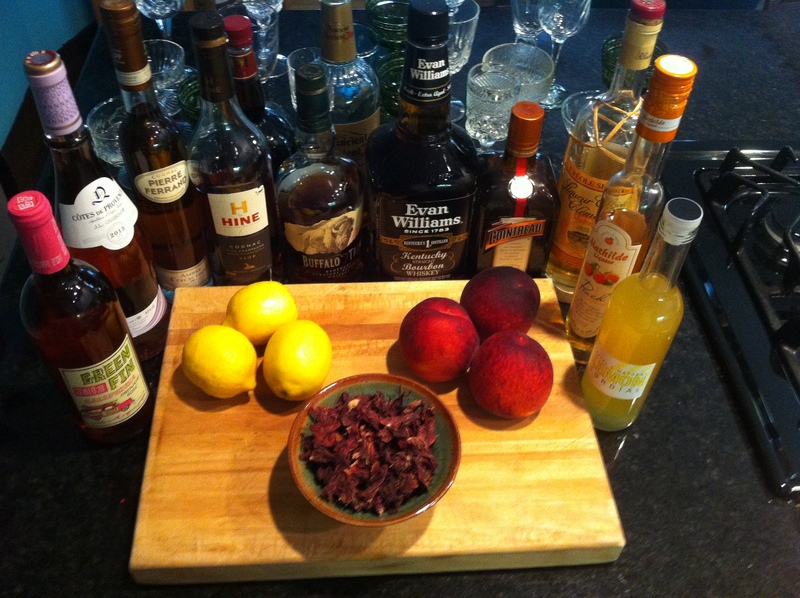 If possible have all the ingredients already chilled before building the punch. Wine, spirits, cordial/sour, tea. I suggest getting a block of ice that can be chipped into large chunks for the punch. If not available, large clear cubed ice works best. You want large pieces that don’t melt too fast, but do melt. Too small and they melt too fast. Too large a block and it just sits there not melting and not chilling. Slice thin lemon wheels and set aside. Thin slice chilled peaches any way you wish to be added to the punch and set aside. 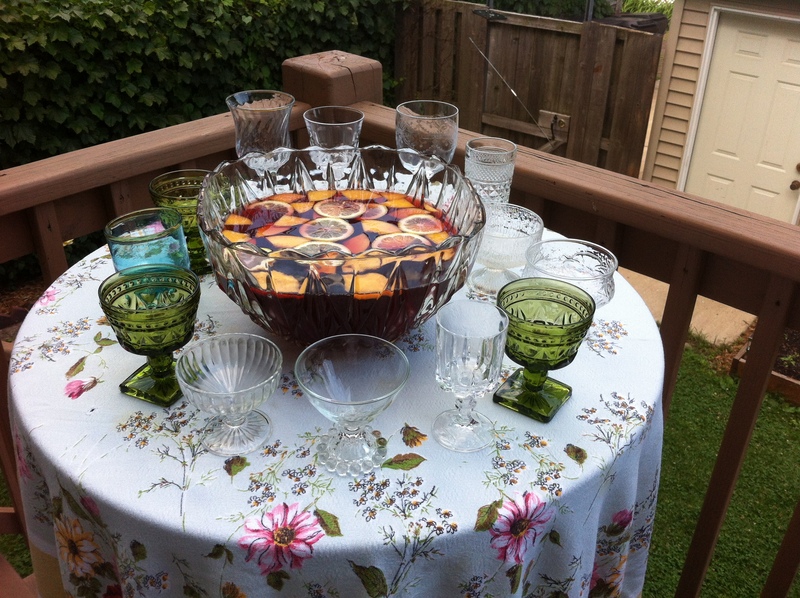 Add the large chunks of ice to the punch bowl to begin chilling the bowl and melt off a little bit. In another container large enough for the punch, add all the spirits, tea, cordial/sour and wine and mix together. Taste for consistency and adjust for your taste if necessary. Pour this over the ice in the bowl and stir lightly to even the temperature. Float the lemon and peaches on the punch.